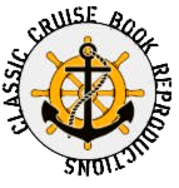 ​ Welcome to Classic Cruise Book Reproductions, your best source for locating and obtaining quality reproductions of Navy cruise books dating from the 1920’s to present. We are a veteran-owned business who takes pride in providing our customers the best possible service and want to ensure you are completely satisfied with your purchase. If for any reason you are not completely satisfied, we will gladly give you a full refund, less shipping and handling. We can make this promise because we know you will be pleased with the final product. As Navy veterans we know the significance of these books and what they represent. So whether the book is for your personal use, medical/legal claim, or just a gift for someone special, we will do our best to ensure you receive a high quality product that you will be glad to show off to family and friends. We have access to virtually all of the Navy Department Library cruise book collection located at the Washington Navy Yard in Washington, DC, which holds more than 1,000 books. This collection includes ships, CB (Construction Battalion) units, RTC (Recruit Training Command) and aviation cadet books (see attached lists of current holdings). Our listing of ship cruise books also holds many books that the Navy Department Library does not hold. So please check our listing to see if your book may be there. We can also reproduce just about any reference material that is held in the Navy Department Library general files. If you are researching a specific topic, please contact us and we will assist you in obtaining copies of the material. Venues include hard copy, CD, or electronic data transfer. All cruise books are donated by the public so there is a possibility there may be some writing in them, slight wear damage, or a picture cut out in some instances. If that is the case, we will notify you immediately and discuss your options. So if you are in the market for a Navy cruise book or other reference material, you have reached the right place. We are here to help you fill in the missing pieces. Please send us a request via our website or call us directly at (703) 897-4737 (Office) or (703) 447-7160 (Cell) and leave a message. We normally respond to requests within 24-48 hours. To expand our services, we have teamed up with another cruise book provider and believe our combined services will benefit you, the customer, in obtaining quality reproductions at very reasonable prices. Our partner website is www.navysite.de, which has an extensive list of cruise books that can either be provided in a downloadable file, hard copy, or on CD. If you do not see your book on either of our websites, don't give up hope. We will try to locate it for you and also give you alternative options. Again, thank you for checking out our site and we look forward to working with you on your project. We would also like to personally thank all of our veterans for their service to our fine country. God Bless America! OUR APRIL SPECIAL IS 15% OFF ANY ORDER OF A SINGLE BOOK OR CD/DVD. IF YOU ORDER TWO OR MORE BOOKS YOU WILL RECEIVE A 20% DISCOUNT ON YOUR TOTAL COST. ALSO, IF YOU CHOOSE OPTION #2, WE WILL THROW IN THE DIGITAL CD OR DVD VERSION FOR FREE.